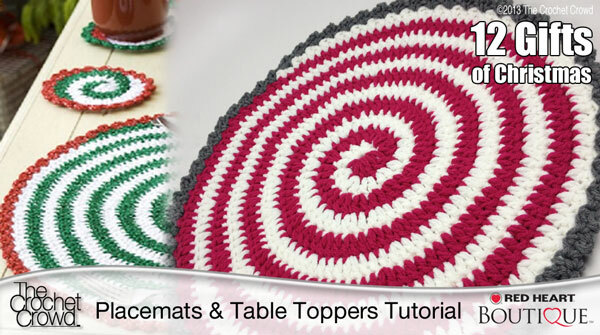 Fun Placemats Pattern. Video tutorial included. Since November 15th, 2013 to New Years Eve, December 31st, 2013 we have been running our Final Crochet Challenge of 2013. Truthfully speaking, Cathy and I had a hard time narrowing down what the final project should be. Instead of coming up with just one idea, we decided to open up the competition to be 11 different projects that were featured in the 12 Gifts of Christmas Mini Series. We had strong doubts that people would be able to get an afghan done before our deadline but we decided to throw one in just in case we were wrong. OH BOY… were we ever wrong. Here is your breakdowns for Entries. You can view them all on our Photo Galleries as well. In no particular order, here are how many entries were received. 30 Pairs of Boot Cuffs. 97 Snowflake Afghans. Each afghan awarded 3 entries as per our challenge. 40 Pairs of Christmas Ball Ornaments. 60 Zig Zag Christmas Stockings. 36 Pairs of Sweet Treat Wrappers. 50 Sangria Wine Bottle Covers. 109 Christmas Placemats (as seen in the photo above). 178 Sets of Coasters. Just for interest sake, there were 6 required per set and our crowd created 1068 individual coasters! The winners of the 3 Red Heart Fully Loaded Yarn Bags with Crochet Crowd Gifts will be selected this Friday. Thank goodness I don’t have to choose my favourite as there are so many I would just go nuts over! The choices are completely random. Many thanks to all who participated. We had a fabulous time viewing your creativity. Our next challenge begins January 15th, 2014. PS. When I initially released this article. I had accidentally not typed in the Sweet Treat Wrapper Entry. It was counted but I just failed to type it out from my notes. Thanks for your understanding. This entry was posted in Crochet Challenges and tagged Challenge, Christmas, coaster, Crochet, crochet crowd, Decoration, Giveaway, Holiday, Mikey. Bookmark the permalink. Fabulous Participation in the Challenge! Check out the photo galleries! Michelle… Maybe we didn’t get your email? When did you email it? Michelle, you are in there… It’s actually the last photograph entered by Cathy. Cathy entered it on the same day you emailed it in. It’s on the top left. I saw it in the gallery, I was actually referring to the list you have above of the entries received. I was just asking if that didn’t count toward the challenge because I didn’t see that on the list. I thought maybe I had gotten confused. I apologize for the misunderstanding. I had thought I had worded it better. All i have to say is awesome for a 2013 ending.